In Came Over The Long Hill by Matthew King In the evening the moon rose over the long hill from the sea. It came up clean from the water on the horizon and over the white beach rocks and through branches of the dark row sycamores that ran the length of the hill. Dark standing apart on its crest, each the same age, height, trim, separated by several yards and outlined alone, trembling against the blue starry night sky in the cool rising wind from the sea. The moon shined bright through the cool, pealed white branches and across to the lake, its light on dark water a flickering, rippled shine made from the fast swimming, urgent eating night ducks. Past the lake were the fountains. They played between rows of early spring flowers before the rising dark, brooding hush of forest, and couldn’t be heard for the waves breaking at sea. 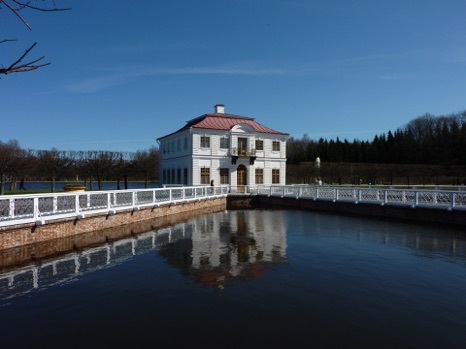 The graveled paths, clean and fresh from new spring rain, ran around the lake to a little white house that stood moated by dark water canals with a dock at the waters edge. Over the moats ran two stone bridges with white painted iron railings that ran ten meters over the still dark salt water of little moated ponds to a shade of stone canopy before the front door of the house where candle light flickered through a window. The moats were filled with fish from the sea who swam through the dark water, now safe from their natural predators, save for a night when a lucky long-haired, fluffy-tailed, friendly brown cat, caught a fish that was twice his size. The next morning the old man found the cat sleeping curled up with a tuna, the tail wrapped around the fish as if to keep it warm. The cat woke and his purring started again as he looked with drowsy luxuriousness at the fish, then stopped suddenly seeing the man. The cat stared at him with eyes serious and desperate. The man laughed. He picked up the fish and carried it to the forest so that someone who didn’t understand would not disturb the cat’s revelry. The cat followed behind with little panicked, pleading mews, his long fluffy hair bouncing with his bounds. His hair made it impossible for him to run with dignity. The cat had a sad meow too, and neither trait went with his character, but perhaps served to shape it. In the cool, damp shaded pines the old man laid the fish on spring ferns for the cat to enjoy and left, but after the sun set the cat had not returned. The old man went out to find him, and as he walked in the cool night into the forest to where he had left the fish, he stopped short before a clearing and strained his eyes, hearing the cat purring loud through the darkness like a lion. He let the cat sleep with the fish that night, and all the nights after until that winter, when after much convincing the cat conceded. He never slept with the fish again, but he didn’t forget, and in the spring visited the skeleton during the nights. The dock behind could not be reached without passing over one of the bridges where now sat a lucky brown cat, the winter cats that lived in the barn in the summer, the old black and white, the fluffy gray hunter, the all black cuddle monster, and a mother with her kittens beside her, all staring with desperate, tail-flicking patience into the water. Then still you have to go through the house. But inside it was a simple house. There was a small kitchen, a dining room with large clean windows that looked out to sea, and a spiral wooden staircase that led to the upstairs bedrooms. Past the house and the lake was a forest, then a low valley with another lake. Spring mornings a mist would rise from the cool water and come up through the pine forest shade into the trees of the high hills; and as the sun rose over the hill in the East the mist would not dissipate in the canopy shade, and the strange brown dog would bark at the forest edge into its misty darkness until the old man came out of the house. Together they walked up the soft dirt path into the cold, damp early mist of the morning forest. The old man breathed deeply through his fast walking and felt the aching cool of the crisp air deep and fresh down in his lungs as small beads of water formed on his brown felt jacket; and the brown dog followed behind, his strange pointed ears stood tall and his hot breath rose out his smiling mouth. In early afternoon the sun was bright in the cloudless sky and ocean air made the plain beyond the long hill cool and fresh in the clean pink light of the eastern sun. Grandchildren ran up and down the stone railed brides as the mother cat and her kittens watched the brown cat from a window. He was sitting patiently at the water’s edge with his tail absolutely still. The old man could hear the children’s laughter as he walked up from the valley in the dark forest shade towards an opening between the trees to the sunny, bright green of the field beyond where there was a light downy fluff of wind that carried the seeds of the trees, which were settling down onto the lake. The dog heard the children much earlier and ran to greet them. The old man stepped out from under the canopy and into the sunlight. He stopped and wiped the sweat from his forehead. The sun was too hot after the climb, but after the humidity of the forest it was a relief. He stretched the old strong muscles of his legs, wincing with the pain, and breathing heavily as he squinted through the sun, and sharp stinging of sweat in his eyes, to see the children in a circle petting the dog. The dog smiled while his long tongue hung out his snout. Beyond, the fountains played in the garden; the cool water rushing high up between the purple, white, and red of the flowers in a white burst, hanging, sparkling eye-achingly bright in the pink amber light, then stopping in a shining white peak that spread out long and clear and smooth against the high blue sky above, and then falling cooly down onto the smooth black stone. Dark summer storm clouds were coming in from the sea. “Grandfather!” the smallest girl yelled. “The dog is pooping.” “Well,” the old man replied, thinking about something else. “Let him poop.” “Ok, I will,” the girl yelled, excited. She was three. For her, bodily functions were a very frank and important business to perform, request and ponder, seriously and often, and to be much discussed and recalled afterwards. The children discussed the actions of the dog while the old man looked out over the long hill to the sky beyond where Western clouds were bringing new hot weather. The clouds were high and soft-looking as they came in slowly across the sky. The old man looked over the hill and recognized the clouds and knew they carried warm summer storms and thought, “It is strange that he is pooping so much today. He must have eaten something strange in the valley.” The whole family watched the parade on television and then ate dinner in the dining room under candle light with the big open windows that looked out into the warm summer rain, and everyone made the old man tell stories about how he meet grandmother during the siege. He told the story as the salty, fresh storm wind came through the windows where beyond dark, heavy churning layers of black and green clouds came over the hill, flashing within themselves with bright pockets of clouded light, then in blindingly clear, chained bolts that stretched across the sky and burned red-purple in your eyes with their thunder which roared far out across the bay to the sea. It was always his wife’s initiative to tell the stories, but now it was his responsibility. The version he told wasn’t so romantic, tragic, or gruesome, and everyone was a little disappointed. Now he preferred to talk about other things. “Maybe we can talk about something other than the dog,” the teenage boy with insolent, fast blinking eyes, said. “Your grandfather fought so that he could talk about his adventures with the dog.” “It’s all I ever thought about,” the old man said seriously, his old blue eyes sparkling at the corners as he tried not to smile, but the years had made wrinkles that made them smile always. “Maybe you had a dog during the war?” the littlest girl asked. “No, the war was a bad time for the dogs. I lived in the city, too. I’ve never felt right having a dog there.” “They roam the streets in packs now. People think they are all dirty, but some are cute. I am friends with a pack that lives in the woods by Smolny Cathedral.” “Congratulations,” her teenager brother said. “Don’t you congratulate me.” “Oh, of course, then I must congratulate not only Rat girl, but her pack of dogs, and their combined force of fleas.” “Grisha! Don’t say that to your sister.” “You’re just jealous of them because they don’t smell and their hair grows in correctly. Everyone knows it,” she said. “Masha!” “But, Mashenka,” the old man said, though laughter, “in seriousness, you must be careful with those dogs.” “I know, but I never provoke them and they know me now and I let them go about their business without trying to coddle them.” “I can’t imagine you without a dog, Grandpa.” “You’ve only known me since I have had one.” “My French teacher had a cat but it died and now won’t have another one because he says it is a betrayal to the first.” “He’s a man?” “Yes. I laughed when he told me because I thought it was a joke, but he was serious.” “He really should open his heart to another. There are so many that live on the street,” the girl’s mother said. “How did the cat die?” “It was nineteen.” “That is a long life for a cat.” “I know it and I told him that and about all the poor cats on the street, but it made no difference to him.” “I wonder if he was broken, somehow?” “Uncle Anton is the same. He had a beautiful Labrador named Gray that would wait for him to come home from work at the Metro on Sennaya. Being the hooligan that he was, he also begged for food and snapped at other dogs, being the king of Sennaya and Sadovaya, but last winter he was killed by a car on Goroxovaya, and now Anton says he is finished with dogs.” “That’s different. Uncle Anton is an unbreakable old goat. He shouldn’t have dealt with dogs in the first place. It isn’t the vocation of unbreakable goats.” “How many dogs have you had that died, Grandpa?” “Many. But they all died naturally.” “Why are some people so affected by it? For some it’s worse when an animal dies than a person.” “As for me, I think Uncle Anton is secretly very excited that now he has less competition for praise in the acts of sleeping and drinking and eating. No matter how vigorously he tried, the dog still always out shined him in Svetlana’s eyes.” Everyone laughed. The brown dog sitting at the old man’s feet wagged his tail and raised his head at the sudden activity. The old man patted his head. “But it is sad, they don’t know what is happening,” the littlest girl pleaded. “They know about as much about the end of it as we do, and they don’t waste time pondering. It’s a much wiser system. Look at him.” Everyone looked at the dog. “To him all that is eternal is the time it takes for someone to give him something off their plate,” he said. “He faces the abyss everyday, and without regard to anything else, without inventing doubts, or justifications, or objectless spites, reaches the end of it. He is dog. He knows what he likes and he goes back and forth to the end of eternity everyday with a long tongue hanging out his mouth and a happily wagging tail. What use is it to him to ponder? He knows everything there is to know. What difference does it make to him that I think his ears are objects of amusement? And look at him now.” The dog looked up at the old man with funny pointed ears bent back behind his head and his eyes opened wide and black, shining wet with innocence in the candle light. “Well, so he understands everything. Now he bests me in all ways.” “But he is a lucky dog.” “Yes... To have luck is tremendous. But what is more is to use it without making intentional, obstinate mistakes to be original. Then you can follow the dog to the pinnacle of his enlightenment.” “But what about the cats and the post man? Dogs hate them. How can they be happy and still hate? It is a jealousy.” “My dogs have always liked cats,” said the old man. “But still.” “Well, really isn’t the post man an obvious enough threat to us all?” “Some dogs become wicked because they live on the streets, or in houses without love or god. What do you expect from them? They aren’t born divine.” “I don’t care about the abyss or pinnacles,” the littlest girl said. “I want to be a kitty and clean my whiskers.” Everyone watched as she showed them how she would clean her whiskers. “And you are much better. I only speak about the thinking of men, dear.” “But we have many cats, too!” “I know it.” “Then let’s discuss the thinking of cats.” “There, too, is a foolishness,” the old man said, looking to the front door where warm summer rain rapped against the window with thunder, and quick flashes of lighting. Beneath the brown cat stared at him in silence, the mirrored luminescence of his eyes shining green through the darkness, asking desperately. “Have you ever seen a cat that isn’t bothered by water? Even the storm rain?” “What does he want Grandpa? It is so strange.” “I don’t know. Why don’t you ask him?” “What do you want, kitty?” The cat didn’t say anything. “He wants to wear a little kitty dress,” the little girl interpreted. “He is a boy, he doesn’t wear dresses. God. I’ve known that for years. Right, Pop?” the littlest replied smartly. “Yes, yes, of course,” said their father, preoccupied with not spilling his soup into his beard. “He is crazy, look at him. You are crazy,” the teenager said to the cat, who kept on undaunted with his desperate looking. “Or just stupid. Fluff for brains. He wouldn’t even eat the chicken I offered him earlier, and then I told him I would feed him to the big dogs that live in the valley and, Oui, where are you going Grandpa?” “Who are you to hinder the business of the cats? He probably saw how dirty your hands always are,” he said. Then, at the two little girls, who were terrified, “There are clean, dry places he can stay under the bridges.” The old man walked with the dog at his side into the darkness of the entryway. The dog and the cat exchanged awkward glances. The dog sniffed the cat’s face. The cat had an eternal hatred for the dog’s happiness. He took a swipe at the dog, hitting him on the snout, then became arched-back and fat tailed against him until the dog withdrew. The cat watched the dog, his long face morose, hurt, inwardly questioning, and his long silly ears pinned again back behind his head. The cat then looked up at the man, his tail still flicking wildly, and made a silent meow. The old man shook his head and reached for the door handle. The cat positioned his face at the door’s edge. As soon as it opened he forced his head into the crack, pushed the door fast open, and rushed out into the storm. The wind brought the rain into the old man’s face as he watched the cat run fast across the bridge, his long funny hair bouncing through the rain and lighting, removing all possibility of dignity. Then he ran in a fluffy blur across the lawn until he disappeared in the rising dark of the forest. The old man looked at the troubled dark swirling of branches and leaves in the bright white flashes and thought, “Why must he see it now?” The old man sat back down at the table. He pressed his hands hard against the arms of the chair to lower himself into the seat. His daughter Oksana, mother of the two, sat beside him. She had a serious, cold weather face, skin without age, eyes that were dark and shining while they questioned with her thin lipped, contemptuous frown. Her face was always so sad in repose, serving only to strengthen the contrast of how bright it became when she smiled. She smiled now at the corners of her mouth as she stared at her father and, reaching for the ivory dish that held the bliny, and said, ”Are you ready for dessert? I brought you raspberry jam and butter from New Zealand. You know they make the best dairy in the world?” “Of course, I know. Our neighbor down in the valley, Anton Antonovich, works now with a man and two cows he bought from New Zealand. He has quite high hopes for them.” “He bought a man?” “Yes, he sure did. A walking encyclopedia of all things cow. I didn’t learn his name. He bought a bull too, from a different city than the cows, but he turned out to be faithful and has been a great disappointment for Anton Antonovich. I think he will have to resort to a Russian bull but Anton Antonovich hasn’t given up hope quite yet. He told me that he has been doing some research into the ecstasies of bulls, and now has some theories that he is developing into quite romantic schemes to trick the bull. The other man is optimistic, too, about these slightly too creative scenarios that Anton Antonovich has developed, and he is certainly not a fool. He truly has a great knowledge of cows. He very much prides himself on the point and recounts his knowledge to you with a quite humble, professional pride, although you can see the pleasure it brings him to speak on the subject, and he is quite convincing. He never doubts himself. As for me, I am not so sure the cows will be successful in the winter. I say nothing of it, however, for my negativity is disgusting within their magnificent plans for the cows. They have promised me some share of the produce if I should let them graze in the fields behind the barn.” “But cows absolutely destroy the fields in the winter. In principle they are even worse than the horses. Especially in the winter.” “I know it. You can already see their mark in the valley, but Anton Antonovich has quite an illusion about it in the face of all the excitement of the coming harvest. Who would want to spoil it for him?” Outside the lightning clapped over the hill, echoing far out across sea. The family talked as they ate the thin, milky sweet bliny; stuffed with hot, melted butter from the New Zealand cows with the local jam in the candle light. Their faces shown; wide smiling cheeks, eyes crinkling at the corners with the small smiles understood only within a family; happily eating and talking and toasts; the summer fires and smog in Moscow; discourses about neighbors; did they or didn’t they, and what the other neighbors thought that and those that, for sure, knew that that they did; these neighbors had awoken in the night to the shots and had looked out the window and seen the lights of the car running fast in the night through the trees before she ran of the road and continued on foot before the police got her on the border trying to cross into Finland, and for some reason she had been wearing her wedding dress, but then why those neighbors can’t be trusted either, and all of it put in a way so the children couldn’t understand; finally that it is of nobody’s business at all; then of the crisis and how people should be ashamed of themselves as they drink and curse on the street; their foul spit frozen to the sidewalk in the mornings in the sunless days of winter as they wait among legless veterans with old gray faces in the dark begging for kopeks, still wearing their medals, and pensioner grandmothers who survived the war still waiting in the early morning cold, alone, to get on the too crowded bus to get to the places that they needed to go and where they are bumped and pushed without apology by a generation that has accomplished nothing but the talent of drinking while walking on two legs and complaining. And, then while German grandmothers sleep in until they have to rise for their afternoon pedicure and what grandmother would have said and, no, shame on you, your grandmother would never have said that; she would have said it more beautifully; the old man saying nothing as he stared long into the light from the candle. He was thinking about the other girl he had been with during the blockade. The old man, being young then, promised her that they would marry. Her name was Alexandra. When she laughed her nose turned red. She was a delicate, fair skinned girl from north of Leningrad, with dark red hair and burning green eyes. When she looked out the window onto the burning city streets golden streaks shined from behind her pupils like the smoke that came out from under doors of houses on fire. She had the type of Russian beauty that suddenly stops thinking in men, all they could feel was their heart beating. Leningrad had already been under the blockade for a year, and people were dying of starvation. His parents died the first winter, first his father, then his mother. His father went for bread and never came back. His mother died shortly after. Although he never believed the reports of cannibalism, then or after, he waited until the thaw to bury them himself. He wanted them to be buried with their rings. And he didn’t have the money to buy one himself, but he had gotten down on one knee and promised her, and then recited the poem of Konstantin Simonov, incorrectly, as he had learned it from the Commissar Phillip Semenovich the night before, who had been drunk. He held her little trembling hand and looked up into her frightened eyes and said, “Wait for me, and I’ll return. Only wait very hard. Wait as if you are filled with sorrow as you watch the yellow rain. Wait when the winds sweeps the snow drifts. Wait in the sweltering heat. Wait when others have stopped waiting, forgetting our yesterday. Wait, even when from afar, no letters come to you. Wait even when others are tired of waiting. Wait even when my mother thinks I am no more. And when friends sit around the fire, and drink to my memory, wait, and do not hurry to drink to my memory, too. Wait, for I’ll return, defying every death. Let those who do not wait say, ‘I was lucky’. They will never understand that in the midst of death, you, with your waiting, saved me. Only you and I will know how I survived. It’s because you waited, as no one else did.” He finished, holding her hand and feeling her heart beating fast through her tiny wrist that brushed, achingly soft, against his own as they watched the whole of the cold horizon on fire. His face now illuminated in the warm crimson light of the candle, as outside the storm ran troubled and racing out across and over the long hill from the sea, his clear eyes shimmering in the candle light as they looked into themselves, trying to see something that wasn’t there anymore. There was quite a bit of drinking after that. He drank with purpose for her, for peace and truth and for company and friendship; drank to the health of the family, then of enemies, then of all, then to the simple, dutiful loyalty of the sturdier objects in the room; he drank to luck, and then finally again to the health of the family. After everyone slept very well, with the exception of the old man. Without analyzing his motivations, he let the dog out into the night and went himself, carefully holding onto the railing with the two girls holding his other arm, to his room to say his prayers at the foot of his bed. The little girls watched through the crack in the door, then helped him to get up off his knees and into bed. The old man thanked the girls, speaking French now, then in Russian, sincerely, he told them goodnight. They closed the door behind them and he waited until he knew everyone was asleep. He went out on the terraced balcony to watch the storm. The night breeze blew through the storm and onto the old man and it was cool and pleasant. He sat in the old metal rocking chair, painted many times white, and watched what was now the slow drizzle and dark flashing mass of clouds making their stately progress as they drifted darkly over the forest hills, where he knew the cat was with his fish. The storm traveled across the plains of the East before it turned to the great farm valleys of the South, where the summer wildfires were still growing through the villages around Moscow and now into the forests around by Chernobyl. The old man looked for a long time across the rippling dark water of the lake to the hill beyond, and then to the clouds coming from the sea, and thought about nothing. The storm clouds passed over the forest hills to the long valleys beyond. The first of the coming light rose up through the stars on the horizon, shining silver points flickering in the open night sky. As it climbed higher it rose dark purple into the stars which dissipated into red, pink, pale pink, then suddenly the bright amber red of the first burning red sliver of morning as the sun rose slowly above the long blue curve of the ocean horizon, and then bright and warmly shining as it came over the hill into what was now the early morning sky. The old man woke suddenly as the warmth touched his face; realizing he had been asleep. The dog was barking in the distance. In the evening the moon rose over the long hill from the sea. It came up clean from the water on the horizon and over the white beach rocks and through branches of the dark row sycamores that ran the length of the hill. Dark standing apart on its crest, each the same age, height, trim, separated by several yards and outlined alone, trembling against the blue starry night sky in the cool rising wind from the sea. The moon shined bright through the cool, pealed white branches and across to the lake, its light on dark water a flickering, rippled shine made from the fast swimming, urgent eating night ducks. Past the lake were the fountains. They played between rows of early spring flowers before the rising dark, brooding hush of forest, and couldn’t be heard for the waves breaking at sea. The graveled paths, clean and fresh from new spring rain, ran around the lake to a little white house that stood moated by dark water canals with a dock at the waters edge. Over the moats ran two stone bridges with white painted iron railings that ran ten meters over the still dark salt water of little moated ponds to a shade of stone canopy before the front door of the house where candle light flickered through a window. The moats were filled with fish from the sea who swam through the dark water, now safe from their natural predators, save for a night when a lucky long-haired, fluffy-tailed, friendly brown cat, caught a fish that was twice his size. The next morning the old man found the cat sleeping curled up with a tuna, the tail wrapped around the fish as if to keep it warm. The cat woke and his purring started again as he looked with drowsy luxuriousness at the fish, then stopped suddenly seeing the man. The cat stared at him with eyes serious and desperate. The man laughed. He picked up the fish and carried it to the forest so that someone who didn’t understand would not disturb the cat’s revelry. The cat followed behind with little panicked, pleading mews, his long fluffy hair bouncing with his bounds. His hair made it impossible for him to run with dignity. The cat had a sad meow too, and neither trait went with his character, but perhaps served to shape it. In the cool, damp shaded pines the old man laid the fish on spring ferns for the cat to enjoy and left, but after the sun set the cat had not returned. The old man went out to find him, and as he walked in the cool night into the forest to where he had left the fish, he stopped short before a clearing and strained his eyes, hearing the cat purring loud through the darkness like a lion. He let the cat sleep with the fish that night, and all the nights after until that winter, when after much convincing the cat conceded. He never slept with the fish again, but he didn’t forget, and in the spring visited the skeleton during the nights. The dock behind could not be reached without passing over one of the bridges where now sat a lucky brown cat, the winter cats that lived in the barn in the summer, the old black and white, the fluffy gray hunter, the all black cuddle monster, and a mother with her kittens beside her, all staring with desperate, tail-flicking patience into the water. Then still you have to go through the house. But inside it was a simple house. There was a small kitchen, a dining room with large clean windows that looked out to sea, and a spiral wooden staircase that led to the upstairs bedrooms. Past the house and the lake was a forest, then a low valley with another lake. Spring mornings a mist would rise from the cool water and come up through the pine forest shade into the trees of the high hills; and as the sun rose over the hill in the East the mist would not dissipate in the canopy shade, and the strange brown dog would bark at the forest edge into its misty darkness until the old man came out of the house. Together they walked up the soft dirt path into the cold, damp early mist of the morning forest. The old man breathed deeply through his fast walking and felt the aching cool of the crisp air deep and fresh down in his lungs as small beads of water formed on his brown felt jacket; and the brown dog followed behind, his strange pointed ears stood tall and his hot breath rose out his smiling mouth. In early afternoon the sun was bright in the cloudless sky and ocean air made the plain beyond the long hill cool and fresh in the clean pink light of the eastern sun. Grandchildren ran up and down the stone railed brides as the mother cat and her kittens watched the brown cat from a window. He was sitting patiently at the water’s edge with his tail absolutely still. The old man could hear the children’s laughter as he walked up from the valley in the dark forest shade towards an opening between the trees to the sunny, bright green of the field beyond where there was a light downy fluff of wind that carried the seeds of the trees, which were settling down onto the lake. The dog heard the children much earlier and ran to greet them. The old man stepped out from under the canopy and into the sunlight. He stopped and wiped the sweat from his forehead. The sun was too hot after the climb, but after the humidity of the forest it was a relief. He stretched the old strong muscles of his legs, wincing with the pain, and breathing heavily as he squinted through the sun, and sharp stinging of sweat in his eyes, to see the children in a circle petting the dog. The dog smiled while his long tongue hung out his snout. Beyond, the fountains played in the garden; the cool water rushing high up between the purple, white, and red of the flowers in a white burst, hanging, sparkling eye-achingly bright in the pink amber light, then stopping in a shining white peak that spread out long and clear and smooth against the high blue sky above, and then falling cooly down onto the smooth black stone. Dark summer storm clouds were coming in from the sea. “Ok, I will,” the girl yelled, excited. She was three. For her, bodily functions were a very frank and important business to perform, request and ponder, seriously and often, and to be much discussed and recalled afterwards. The whole family watched the parade on television and then ate dinner in the dining room under candle light with the big open windows that looked out into the warm summer rain, and everyone made the old man tell stories about how he meet grandmother during the siege. He told the story as the salty, fresh storm wind came through the windows where beyond dark, heavy churning layers of black and green clouds came over the hill, flashing within themselves with bright pockets of clouded light, then in blindingly clear, chained bolts that stretched across the sky and burned red-purple in your eyes with their thunder which roared far out across the bay to the sea. It was always his wife’s initiative to tell the stories, but now it was his responsibility. The version he told wasn’t so romantic, tragic, or gruesome, and everyone was a little disappointed. Now he preferred to talk about other things. “Maybe we can talk about something other than the dog,” the teenage boy with insolent, fast blinking eyes, said. “It’s all I ever thought about,” the old man said seriously, his old blue eyes sparkling at the corners as he tried not to smile, but the years had made wrinkles that made them smile always. “Maybe you had a dog during the war?” the littlest girl asked. “Congratulations,” her teenager brother said. “You’re just jealous of them because they don’t smell and their hair grows in correctly. Everyone knows it,” she said. “He really should open his heart to another. There are so many that live on the street,” the girl’s mother said. Everyone laughed. The brown dog sitting at the old man’s feet wagged his tail and raised his head at the sudden activity. The old man patted his head. “But it is sad, they don’t know what is happening,” the littlest girl pleaded. Everyone looked at the dog. The dog looked up at the old man with funny pointed ears bent back behind his head and his eyes opened wide and black, shining wet with innocence in the candle light. “My dogs have always liked cats,” said the old man. Everyone watched as she showed them how she would clean her whiskers. “There, too, is a foolishness,” the old man said, looking to the front door where warm summer rain rapped against the window with thunder, and quick flashes of lighting. Beneath the brown cat stared at him in silence, the mirrored luminescence of his eyes shining green through the darkness, asking desperately. “He wants to wear a little kitty dress,” the little girl interpreted. “He is a boy, he doesn’t wear dresses. God. I’ve known that for years. Right, Pop?” the littlest replied smartly. “Yes, yes, of course,” said their father, preoccupied with not spilling his soup into his beard. Outside the lightning clapped over the hill, echoing far out across sea. The family talked as they ate the thin, milky sweet bliny; stuffed with hot, melted butter from the New Zealand cows with the local jam in the candle light. Their faces shown; wide smiling cheeks, eyes crinkling at the corners with the small smiles understood only within a family; happily eating and talking and toasts; the summer fires and smog in Moscow; discourses about neighbors; did they or didn’t they, and what the other neighbors thought that and those that, for sure, knew that that they did; these neighbors had awoken in the night to the shots and had looked out the window and seen the lights of the car running fast in the night through the trees before she ran of the road and continued on foot before the police got her on the border trying to cross into Finland, and for some reason she had been wearing her wedding dress, but then why those neighbors can’t be trusted either, and all of it put in a way so the children couldn’t understand; finally that it is of nobody’s business at all; then of the crisis and how people should be ashamed of themselves as they drink and curse on the street; their foul spit frozen to the sidewalk in the mornings in the sunless days of winter as they wait among legless veterans with old gray faces in the dark begging for kopeks, still wearing their medals, and pensioner grandmothers who survived the war still waiting in the early morning cold, alone, to get on the too crowded bus to get to the places that they needed to go and where they are bumped and pushed without apology by a generation that has accomplished nothing but the talent of drinking while walking on two legs and complaining. And, then while German grandmothers sleep in until they have to rise for their afternoon pedicure and what grandmother would have said and, no, shame on you, your grandmother would never have said that; she would have said it more beautifully; the old man saying nothing as he stared long into the light from the candle. He was thinking about the other girl he had been with during the blockade. The old man, being young then, promised her that they would marry. Her name was Alexandra. When she laughed her nose turned red. She was a delicate, fair skinned girl from north of Leningrad, with dark red hair and burning green eyes. When she looked out the window onto the burning city streets golden streaks shined from behind her pupils like the smoke that came out from under doors of houses on fire. She had the type of Russian beauty that suddenly stops thinking in men, all they could feel was their heart beating. Leningrad had already been under the blockade for a year, and people were dying of starvation. His parents died the first winter, first his father, then his mother. His father went for bread and never came back. His mother died shortly after. Although he never believed the reports of cannibalism, then or after, he waited until the thaw to bury them himself. He wanted them to be buried with their rings. And he didn’t have the money to buy one himself, but he had gotten down on one knee and promised her, and then recited the poem of Konstantin Simonov, incorrectly, as he had learned it from the Commissar Phillip Semenovich the night before, who had been drunk. He held her little trembling hand and looked up into her frightened eyes and said, “Wait for me, and I’ll return. Only wait very hard. Wait as if you are filled with sorrow as you watch the yellow rain. Wait when the winds sweeps the snow drifts. Wait in the sweltering heat. Wait when others have stopped waiting, forgetting our yesterday. Wait, even when from afar, no letters come to you. Wait even when others are tired of waiting. Wait even when my mother thinks I am no more. And when friends sit around the fire, and drink to my memory, wait, and do not hurry to drink to my memory, too. Wait, for I’ll return, defying every death. Let those who do not wait say, ‘I was lucky’. They will never understand that in the midst of death, you, with your waiting, saved me. Only you and I will know how I survived. It’s because you waited, as no one else did.” He finished, holding her hand and feeling her heart beating fast through her tiny wrist that brushed, achingly soft, against his own as they watched the whole of the cold horizon on fire. His face now illuminated in the warm crimson light of the candle, as outside the storm ran troubled and racing out across and over the long hill from the sea, his clear eyes shimmering in the candle light as they looked into themselves, trying to see something that wasn’t there anymore. There was quite a bit of drinking after that. He drank with purpose for her, for peace and truth and for company and friendship; drank to the health of the family, then of enemies, then of all, then to the simple, dutiful loyalty of the sturdier objects in the room; he drank to luck, and then finally again to the health of the family. After everyone slept very well, with the exception of the old man. Without analyzing his motivations, he let the dog out into the night and went himself, carefully holding onto the railing with the two girls holding his other arm, to his room to say his prayers at the foot of his bed. The little girls watched through the crack in the door, then helped him to get up off his knees and into bed. The old man thanked the girls, speaking French now, then in Russian, sincerely, he told them goodnight. They closed the door behind them and he waited until he knew everyone was asleep. He went out on the terraced balcony to watch the storm. The night breeze blew through the storm and onto the old man and it was cool and pleasant. He sat in the old metal rocking chair, painted many times white, and watched what was now the slow drizzle and dark flashing mass of clouds making their stately progress as they drifted darkly over the forest hills, where he knew the cat was with his fish. The storm traveled across the plains of the East before it turned to the great farm valleys of the South, where the summer wildfires were still growing through the villages around Moscow and now into the forests around by Chernobyl. The old man looked for a long time across the rippling dark water of the lake to the hill beyond, and then to the clouds coming from the sea, and thought about nothing. The storm clouds passed over the forest hills to the long valleys beyond. The first of the coming light rose up through the stars on the horizon, shining silver points flickering in the open night sky. As it climbed higher it rose dark purple into the stars which dissipated into red, pink, pale pink, then suddenly the bright amber red of the first burning red sliver of morning as the sun rose slowly above the long blue curve of the ocean horizon, and then bright and warmly shining as it came over the hill into what was now the early morning sky. The old man woke suddenly as the warmth touched his face; realizing he had been asleep. The dog was barking in the distance.